Hot summer days are waning, and we at CAPACES are excitedly channeling the momentum from our anniversary celebration into our fall programs. You may have noticed a recent Facebook trend – and it’s not the Ice Bucket Challenge! Friends are challenging one another to write about what they are grateful for each day for one week. And we want YOU to know we are truly, deeply grateful for YOUR support (that’s an understatement!). So many faces graced the CAPACES campus at our anniversary event: teachers of all kinds, giddy children, long-term volunteers and new friends, members of the government and non-profit world, and colleagues from most of our sister organizations. We are honored, and want to thank all of you who have brought CAPACES Leadership Institute to where we are today, and launching us into an even brighter future. You may have heard over the din of the lively music – we recently began asking friends to donate monthly to CAPACES just as all of the staff do. Ten people at the anniversary chose to become sustaining donors, and many more offered a one-time gift. Each and every gift matters, and double of what you might think: CAPACES was offered a $20,000 matching grant. The gifts supporting our anniversary, including the monthly donations, total $7,085, and will be doubled! We have $12,915 to fundraise by the end of the year. If you would like to become a sustaining donor, please donate by credit card online or email us at info@capacesleadership.org. Thanks for ALL you do to serve our community; we are truly thankful. CAPACES Leadership Institute is a non-profit organization based in Woodburn, Oregon that prepares leaders with the political consciousness and skills needed to lead and support social justice work. More photos will be up on our website and Facebook soon! 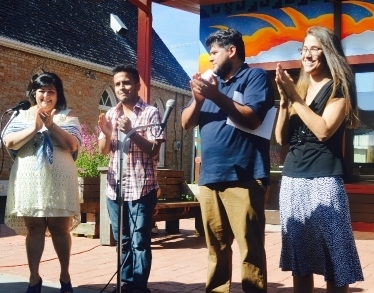 * Campesino Clap: CAPACES staff lead the community in a “ASÍ se puede” applause. *Julizza, TURNO youth student, speaking to a captive audience. ← August 9: Save the date!